Keeping Abreast in Victoria: What's On Wednesday? Starting November 19, Wednesday is our new drop in day at the Breastfeeding Centre in Dandenong. We welcome mothers, members and volunteers to visit, enjoy free tea and coffee, chat about breastfeeding, watch DVDs, browse our library and connect. The kids come too and will love our play corner! You are welcome to bring along some fruit or other healthy foods to share for morning tea/lunch. 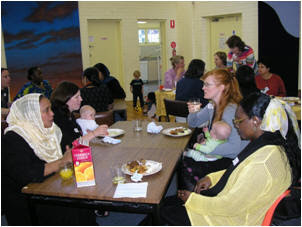 We welcome mums from all suburbs and are located just 3 mins from Eastlink, very close to Princes Highway in Dandenong. Bring a friend or two!!! Dates for the year are November 19, 26 and December 3, 10 and 17. Drop in is welcome between 10.30am and 3.30pm. We will resume in late January after the summer break. Hoping to see lots of visitors!